Yes, there ARE 23 more days until the Big C, but in this household, I'm head chauffeur, cook, bottle washer (I guess we don't have any actual bottles) and general schedule manager for the troops... so with choral, piano and orchestra practice, play and music program rehearsals, costumes to make, parts to learn, and bake sales to bake for... well.. whew! I haven't made anything creative or original, or taken any pictures really worth blogging about. So, this soup then, was sort-of a fortunate "accident" or desperation dinner - however you want to look at it. I had about 2 cups grilled, seasoned vegetables left over from last night's Mexican fajitas (sauteed peppers, carrots, onions and tomatoes with chili powder, oregano and black pepper) as well as 1/2 a can of pumpkin from previous baking. I combined veggies and pumpkin, added about 1/2 cup coconut milk and some vegetable broth until it was a thick soup-like consistency. Simmered until heated thru, served with cornbread. There ya have it. 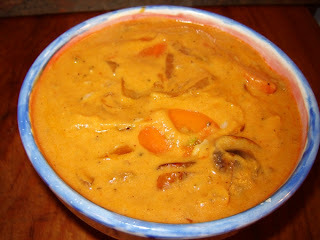 Warm, hearty pumpkin soup flavored with the smokey, grilled veggies and Mexican spices. Might sound like an odd combination but believe me, the flavors were awesome and it went together in about 10 minutes. What more could you need on a busy day? So yeah, that's about all. Just thought I'd post my "soup-in-a-minute" even if it's not an elaborate 5 course Holiday Vegan spread... That'll come later. I'll leave you with this great t-shirt I just might be getting for some unnamed person in my household... and if my children are reading this by some ODD chance... "Go back to your MySpacing or something!" Happy - and busy - December to all of you. yr schedule made my head spin! that shirt is too cool. Pumpkin soup is big here in Australia (where they call it a Butternut Pumpkin rather than Squash) but I never ate it when I lived in the US. Your version looks really yum! But I'd be interested in hearing more about your fajitas! I tried to order vegan fajitas when we were out at a Mexican restaurant lately and they said, "well, there wouldn't be much in it without the meat." I thought ... aren't there heaps of grilled veggies in it? So maybe you could post a quick idea of how you make your fajitas? I'd love to know. Thanks, love your blog! Your Pumpkin soup looks about the best thing that happened on this rainy day where i'm sitting here shivering tofu mom!, there's a can of pumpkin soup in the can drawer but that can't really compete with your pumpkin soup picture. 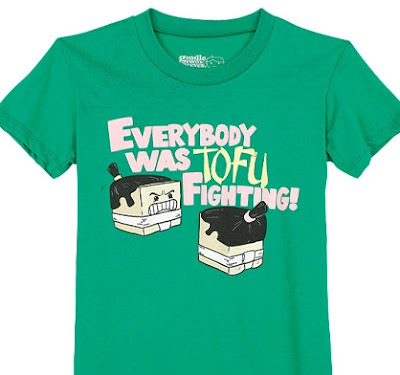 The shirt is tofu kicking cute & charming for a Christmas gift, where are you getting it from by any chance? that soup looks delicious, and the shirt is hilarious! i love when fortuante accidents turn into great dishes. mmm, lovely soup!! your recipes are always so enticing!! I have GOT to have that t-shirt!! It's cracking me up. i have this shirt! haha. did u find it at delia's?